Join us for the BDC's 4th Annual Bronx Gentrification Conference bringing together community residents with leading experts in zoning, tenants' rights, investigative practices and much more. Bronx residents and workers only. Limited workshop seating is available--you must pre-register. 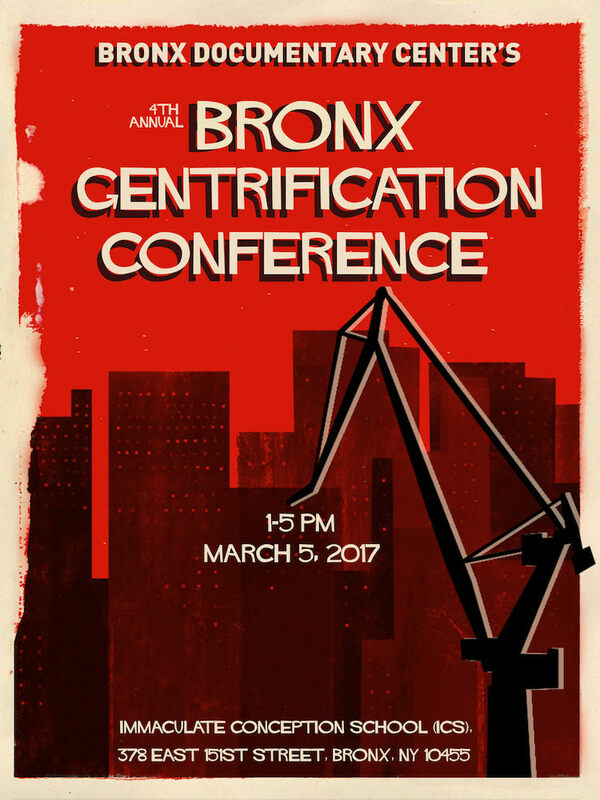 This year’s conference will focus on a series of workshops that will provide residents an understanding of gentrification in the Bronx and the organizing tools to push back and/or mitigate the effects. Each workshop will take place in three 30-minutes sessions, giving participants the opportunity to attend in three workshops during the conference. Childcare will be available. The urban planning profession has historically been, and still remains, a predominately white field. Urban planners are one of the many agents that help shape housing policy, infrastructure planning, and economic development initiatives in neighborhoods across the city. It is important that the planning field better reflect the diversity of the city as a whole. In this workshop participants will be introduced to the urban planning profession, explore ways in which their local knowledge and understanding of neighborhoods mirrors many of the skills that urban planners are trained in, and identify key points that planners need to know working in New York City neighborhoods. Are you experiencing harassment from your landlord? Know your your rights! This workshop will address your rights and responsibilities around what to do if you are experiencing harassment/in fear of landlord retaliation and are worried about your housing. We have housing, criminal defense/immigration expertise to address your questions and concerns. Zoning law regulates land use across the city and shapes buildings, blocks, and whole neighborhoods. It can be a tool for preservation or for rapid physical and economic development. How does it work? Why is it so controversial? This set of activities explains the zoning of density, bulk, land use, and how proposed rezonings could affect your neighborhood. This workshop will examine how community land trusts can help stop hyper real estate speculation in the age of mass development and community displacement. This workshop will explore the historically racist motivations behind major government-sponsored and supported land use actions. We will look at lessons learned, and how the Bronx Coalition for a Community Vision is building power to plan in a way that is fair and equitable first and foremost to the local residents and businesses, as well as those in surrounding communities. What's coming to your block? In this workshop, you'll learn step-by-step tools to use public databases to get insight into what new developments are being built and who owns the buildings your block. We'll also talk about tools that don't require a computer for those without a computer or internet at home. In New York City, your zip code says more about your health than your genetic code. Differences in health outcomes, from rates of disease to life expectancy mean that your neighborhood might literally be making you sick. This is unfair, and unjust. Join public health researchers from New York University to learn about the connections between neighborhoods, gentrification, and health. We will talk about how to understand the health of your neighborhood, as well as concrete steps you can take to protect community wellness. During this interactive, solution-focused workshop, participants will be invited to reflect on their own relationship to money and ownership from an emotional and psychological perspective. We will also discuss practical resources and strategies for those interested in ownership as well as share our own path to homeownership. Come share your stories! Activists and community members Marty Rogers and Libertad Guerra will moderate and encourage attendees to tell their stories of organizing and community successes in pushing for fair and just communities. They will also discuss struggles and successes from years past, including reopening firehouses and closing the medical waste incinerator in the South Bronx. What can the arts look like in our community in the face of new real estate development? This workshop explores the ways artists and non-artists can get together to shape the places where the live and work. The workshop will discuss issues that affect Bronx residents in the current real estate landscape: (1) Achieving deeper affordability in publicly-financed new housing construction; (2) Maintaining a community preference for new affordable housing without running afoul of Fair Housing Laws; and (3) The inherent tension between advocacy and development. Stay updated on our latest news. © BRONX DOCUMENTARY CENTER | ALL RIGHTS RESERVED.